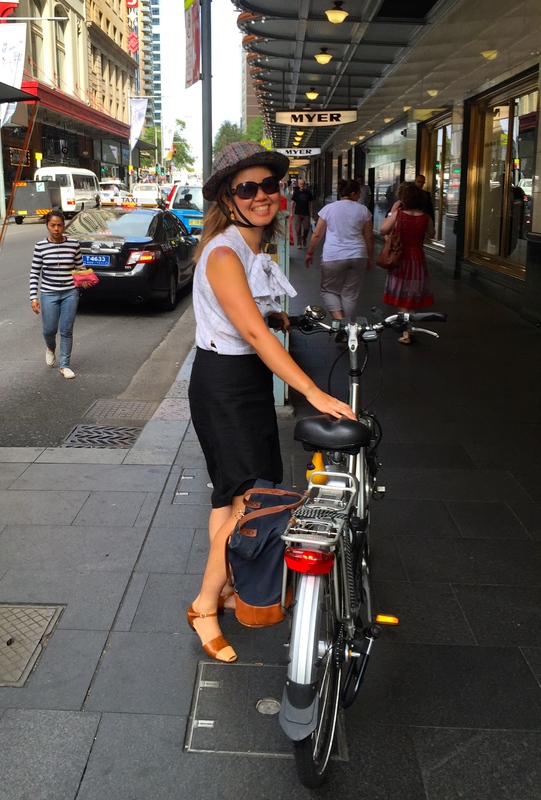 Men especially are often confused or impressed by my ability to bicycle in heels. I think it’s akin to being able to parallel park in one attempt. In reality, it’s not very difficult (to do either) and while many women choose not to wear heels and certainly, beautiful flats have made an appearance this Spring, riding in heels is easy. It’s certainly easier than walking in them. If you’ve never ridden in heels before, it makes sense to work up to it. I would suggest trying a shoe with a lower heel to start. I bought these beautiful Bruno Magli sandals second-hand at Pelle Shoes in Paddington a few years ago. Bruno Magli at a fraction of the cost. Hooray! I like to recommend Ergon pedals to start out which most good bicycle stores stock. They are easy to install on any bike. 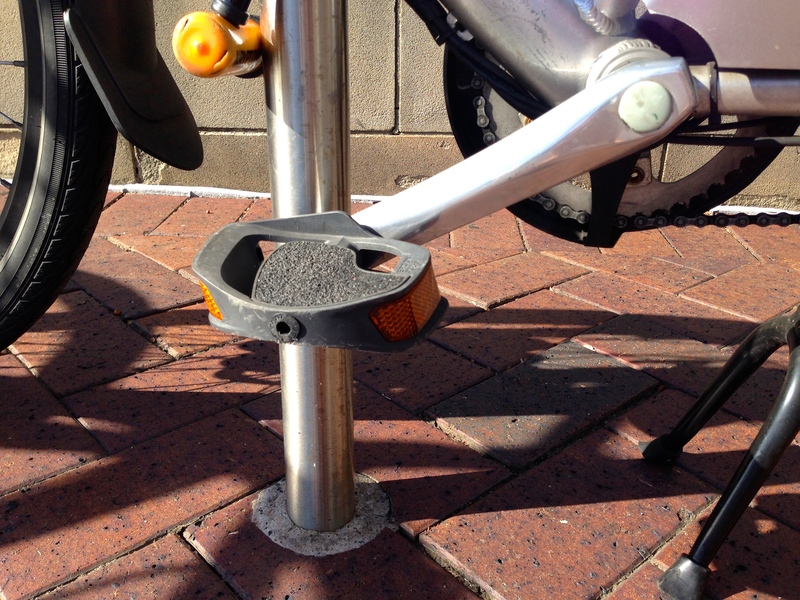 The pedal itself has a sandpaper-like surface that grips rubber soles. 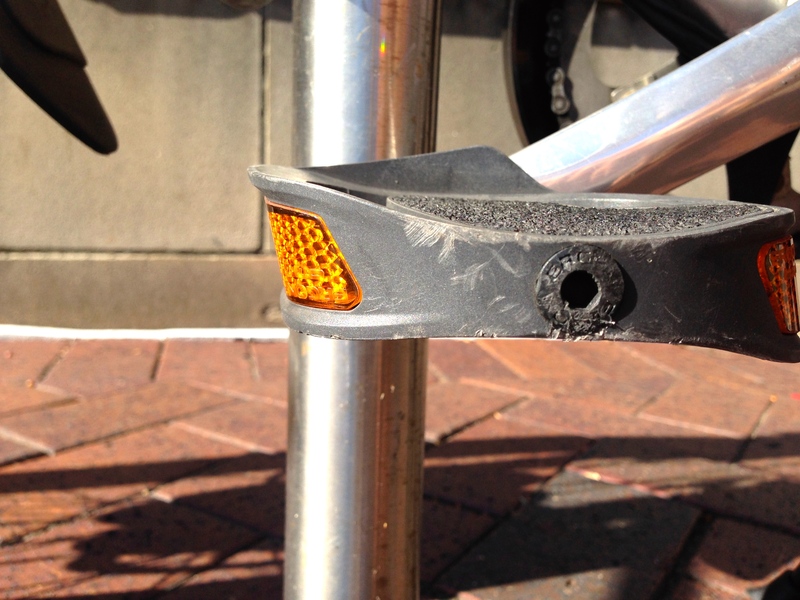 The shape of the pedal cradles your shoe. It also places your foot in the optimal position to obtain the most amount of leverage when pedaling. The result is a super-comfortable-ride, even in heels. And remember, you always pedal with the ball of your foot, not your heel. Right? 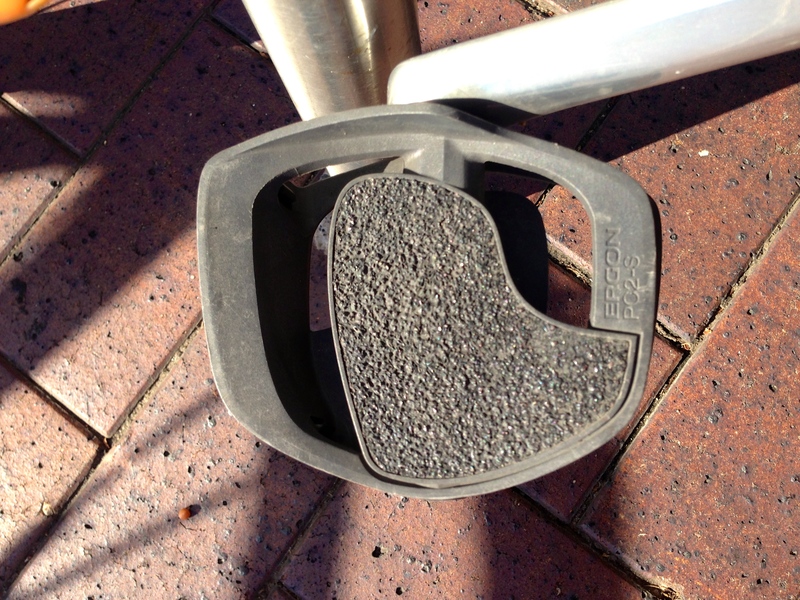 Ergon pedals have a distinctive shape. …is just waiting to cradle your foot. At the shoe repair shop, I had the sandals resoled with a rubber sole instead of leather. While leather is more breathable, it’s also more slippery. When summer arrives in Sydney, my feet stay cool in these open sandals despite the rubber sole. I love the colour of the sandals as they match the leather trim of the Linus bag. Apparently, the truck driver did too as he blew me a kiss while I was locking up! Try riding in a lower heel for a few weeks and then try some higher heels. Then take the plunge and try some heels great for going out in the evening. Just remember to use the balls of your feet for take off and landing. Greater surface area=more comfortable landing. 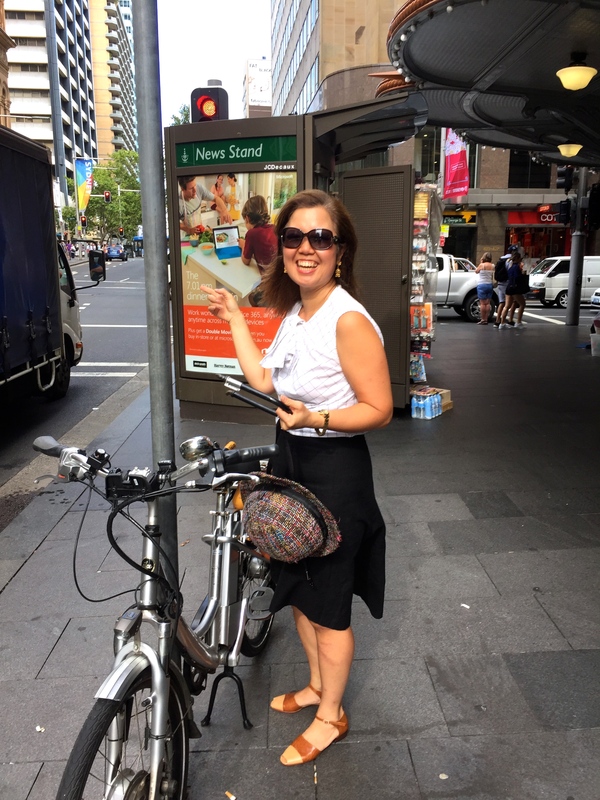 Today’s ensemble: Kyotap skirt, blouse from long departed designer on Crown Street, traditional gold Indian earrings, Bruno Magli sandals, Yakkay helmet, Dior sunglasses, Linus Eleanor handbag, EZee Sprint bicycle, Kryptonite lock. Do you only wear heels with an ankle strap? I’m concerned my heel would slip out of the heel of my shoe. Hi Dayna, a great question! I find that the ankle strap is a great help to keep my heels on. But I can manage with a few other pairs of heels without the strap. I like Geox heels and the fit is quite snug. Also, in Spring/Summer I don’t wear tights. The sweat from my feet also helps to keep them on. I realize that I probably curl my toes when I stop and put my foot down to get a better grip. So pleased you are enjoying! 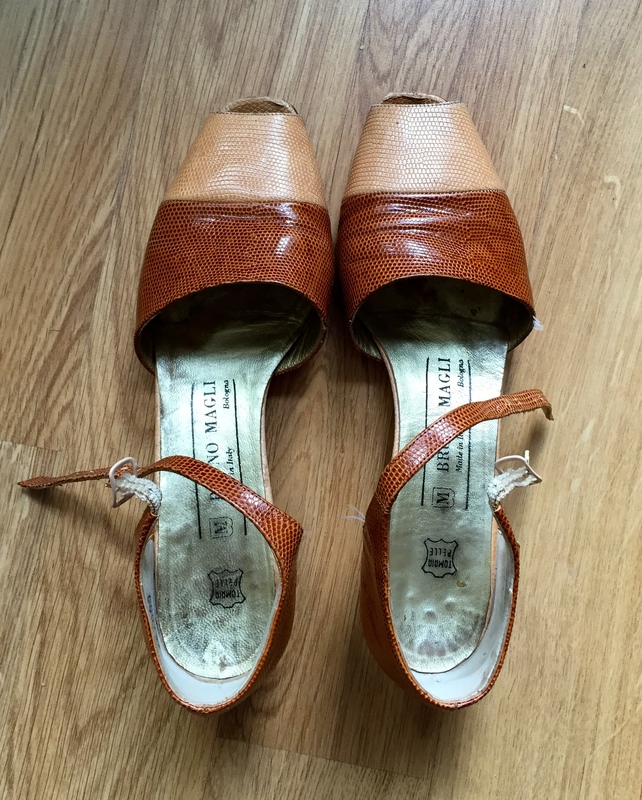 Some of my heels have loosened a bit, being leather – I guess if they slip when I walk then I’m not going to wear them riding (and vice versa).